Earth is the only planet in our solar system that supports human life for a variety of reasons: the temperance of the climate, the availability of water, the presence of gravity. Our unique ozone layer is also vital to our existence on the third rock from the Sun. We have all heard of the hole in the ozone layer, but are we truly aware of the causes of ozone degradation and the steps we can take to protect this important element of our atmosphere? Ozone (O3) is an unstable molecule comprised of three oxygen atoms. Depending on where it occurs, ozone can be both detrimental and beneficial. Tropospheric ozone, which occurs in the lower levels of the Earth’s atmosphere, is a greenhouse gas and a pollutant caused by industrial and natural processes, and it is one of the main components of smog. Stratospheric ozone, however, exists in the upper levels of the Earth’s atmosphere and absorbs 93 to 99 percent of ultraviolet (UV) rays from the sun, which are potentially damaging to life on Earth. This important part of our atmosphere, or what is commonly called the ozone layer, is in danger, though. The hole in the ozone layer refers to a significant thinning of stratospheric ozone discovered over Antarctica in 1985. However, the depletion of stratospheric ozone is a continuing, worldwide concern. WHAT IS CAUSING THE DEPLETION OF STRATOSPHERIC OZONE? Substances known as chlorofluorocarbons (CFCs) and hydrochlorofluorocarbons (HCFCs) are major causes of stratospheric ozone depletion. CFCs and HCFCs have been widely used as refrigerants, insulators, adhesives, propellants and solvents. Other common ozone depleting chemicals include methyl bromide (a substance used in pesticides), halon (a substance used in fire extinguishers), tetrachloromethane (a substance used in pharmaceutical manufacturing) and methyl chloroform (an industrial solvent). These chemicals contain chlorine atoms that destroy ozone molecules. In fact, one chlorine atom can destroy more than 100,000 ozone molecules. HOW DOES THE DEPLETION OF STRATOSPHERIC OZONE AFFECT LIFE? Diminished amounts of stratospheric ozone allow more radiation from the sun to reach the Earth’s surface, and in turn, increased amounts of radiation have adverse effects on public health, fiscal resources and the environment. Prolonged exposure to UV rays can cause sunburn, cataracts, a weakened immune system and cancer – all of which lead to greater medical expenses. An increase in the presence of UV radiation can also lead to reduced crop yields and disruptions in the marine food chain, causing a loss of revenue and decreased food production. In addition, the depletion of stratospheric ozone alters the temperature distribution in the atmosphere and may contribute to cumulative climate change. 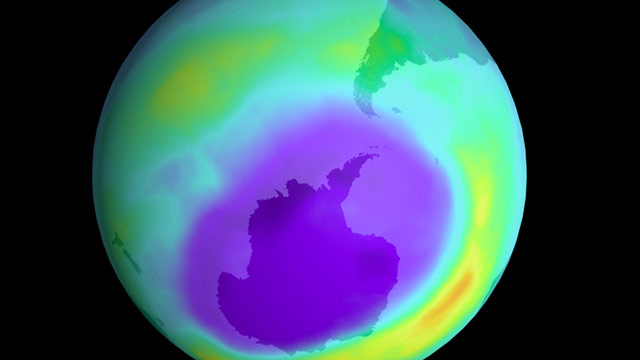 WHAT IS BEING DONE TO PROTECT THE OZONE LAYER? Measures have been pursued nationally and internationally to regulate damaging chlorine-based chemicals. Ratified by all members of The United Nations, the Montreal Protocol on Substances That Deplete the Ozone Layer was introduced in 1987 and was designed to reduce the production and consumption of ozone depleting substances. Considered to be one of the most successful environment protection agreements in the world, the Montreal Protocol specifically addresses the CFCs and HCFCs that significantly contribute to ozone degradation, and it contains phase-out management plans. Hydrofluorocarbons (HFCs) will ultimately replace CFCs and HCFCs. Unlike CFCs and HCFCs, HFCs do not contain chlorine and therefore have no ozone depletion potential. If we curtail the production and use of ozone depleting substances, stratospheric ozone that is created through natural processes should restore the ozone layer by 2050. To prevent pollution from detrimental tropospheric ozone and to prevent the degradation of beneficial stratospheric ozone, you can be more conscious of your use of ozone depleting substances. – Properly maintain heating, ventilation and air conditioning systems (HVACs). Immediately repair any leaks. Coolants can often contain ozone depleting substances. – Ensure that CFCs, HCFCs, halons and related substances are properly captured and recycled. Emissions from existing banks of chlorinated chemicals are not regulated under the Montreal Protocol and could still pose a threat to the ozone layer. – When replacing your air conditioning system, consider a model that does not contain CFCs or HCFCs. – Replace halon fire extinguishers with carbon dioxide or foam alternatives if possible. – Reduce your energy consumption. – Avoid the use of products that contain volatile organic compounds, CFCs, HCFCs and other ozone depleting substances to reduce impacts on the ozone layer and improve air quality. Visit the Environmental Protection Agency – Ozone Depleting Substances for a list. September 16 is International Day for Preservation of the Ozone Layer. Learn more at The United Nations.